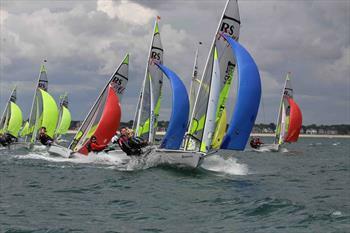 The 2014 RS Feva World Championships went off with a bang in true RS Feva style with 184 RS Fevas, 368 sailors and hundreds of parents, siblings and supporters descended on Yacht Club de Carnac, in Brittany for the 7th World Championships in 8 years. First launched in 2002 and with around 550 boats sold every year the fleet has grown at an incredible rate on a global scale, and the World Championships, now held annually since being awarded ISAF International Class status, demonstrate the sheer volume of sailors and nations involved in the class. This year, competitors from 18 different nations around the world came together to compete in the small town in France, making for quite the on-the-water spectacle for the unsuspecting holidaymaker in Carnac. The event officially welcomed each team with the Opening Ceremony after the first full day of the qualifying series. 2 days of qualifying and the 184-boat fleet were split into gold, silver, and bronze, to kick off championship racing. Wind conditions throughout the week were varied, testing sailors across the range. After an opening light day a couple of heavier wind days were followed by some more lighter air – with a postponed start to racing on the penultimate and last days. The event was blessed with sunshine, and YC Carnac provided a fantastic atmosphere in the boat park for sailors and supports alike. In true Feva style, the camaraderie among the sailors is at it's highest at the Worlds, with sailors enjoying the nations beach rugby after sailing. Five nations featured in the top ten, illustrating the sheer international scale the RS Feva has grown to. On the water British duo Harvey Martin and Bobby Hewitt sailed a successful championship clinching the title and holding off fellow British pairing Piers Nicholls and Freddie Peters who took silver. Czech team Nikol Stankova and Vaclav Brabec took bronze at the end of the regatta, repeating their 3rd place from the European Championships in May. 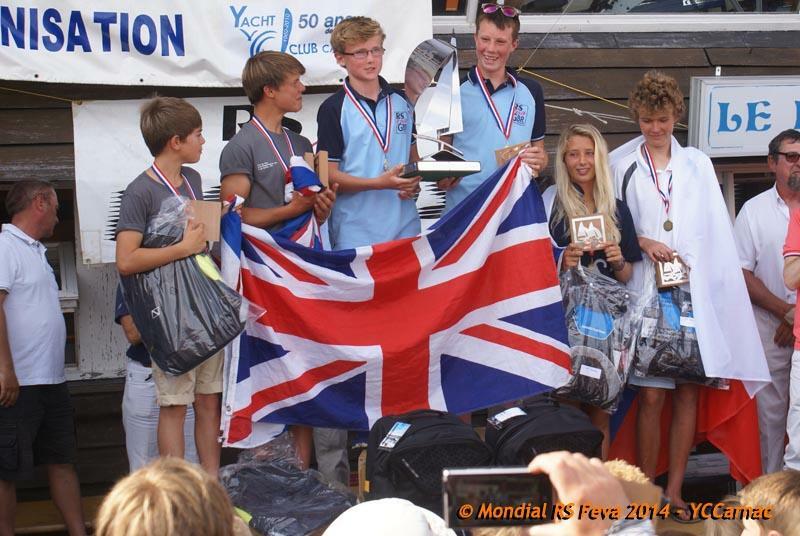 In the silver fleet British team Tristan Payne and Jake Capenter finished the series in first place, closely followed by French duo Jean Leo Touffet and Jade Saunier. Dutch pair Martijn Jessurum and Nynke Nell took home gold in the Bronze fleet. Socially throughout the week, the RS Feva Class did not disappoint. Following the Opening Ceremony, the week continued with the Dutch Party and a live band in the boat park, followed by the Championship BBQ hosted by the club and Pimms Party run by the Brits. Prize giving concluded the week and gave the sailors a chance to say final farewells until the next international event – although a large contingent of Dutch, French, Italians, Czechs, Estonians and Brits did play beach rugby and consume ice creams together until darkness intervened. The RS Feva Class has grown from strength to strength over the years, being fully integrated into the performance development programs of many of the European sailing federations including the UK, Ireland, Italy, the Netherlands, Norway and Sweden. In addition significant racing and training activities are high in Belgium, Czech Republic, Denmark, Spain, Estonia France, Germany, Malta and Switzerland. 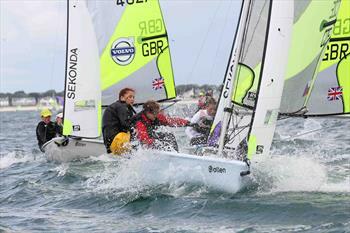 In North America club fleets are developing, and more and more junior sailors are adopting the Feva as their chosen boat. The Feva sits perfectly between the Optimist, and youth classes such as the 420 and 29er as a transitional boat, as well as acting as a learn-to-sail boat for sailors just starting out. Further development for the class is prominent in both Australia and New Zealand, and in Asia and the Middle East. A fair number of ex-Feva sailors now grace the top echelons of the 470, Nacra 17, 49er and 49erFX classes as well! The World Championships in 2015 are set to be held in Travemunde, Germany from 18-25 July with over 20 nations expected to attend.